If you’re looking for a new home that will make you feel on top of the world every single morning, the four luxury new penthouses just coming onto the market at the Fitzroy Collection in Bracknell could be perfect for you. Spacious layouts, designer bathrooms and well-appointed kitchens in all the stunning homes at The Fitzroy Collection mean that every apartment has a luxurious feeling; but the newly released three-bedroom penthouses are the pinnacle of the development in more ways than one. 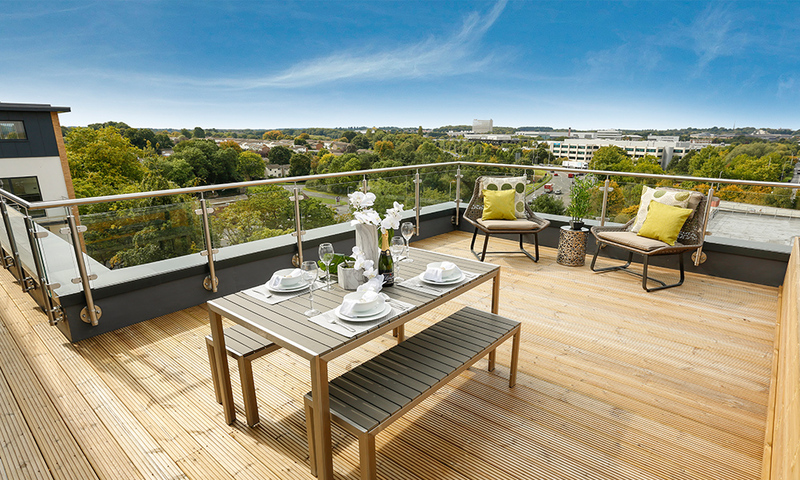 The four penthouses, which take up the entire 5th floor of Dorchester Mansions, also boast the luxury of a giant wrap-around glass chrome balcony and terrace, giving plenty of outdoor living space from which to enjoy the uninterrupted views over the Bracknell countryside and the beautifully planted and maintained grounds around the Fitzroy Collection. And of course, there’s no need to worry about climbing the stairs – both buildings have lifts to just outside your front door. The lateral penthouses are a very generous 108 sq m (1163 sq ft) in size internally, with a further 61 sq m (656 sq ft) of terrace space that wraps around the lounge and dining area and the three spacious bedrooms. To put it into perspective, according to the Horticultural Trades Association, the average British garden size is now just 14 sq m, or less than a quarter of the space of one of the penthouse terraces. The fully lit terraces have ample space for a dining set, making them ideal for summer breakfasts, soaking up the sun in a deckchair or indulging in a nice glass of wine and watching the beautiful views as the sun goes down. Despite being conveniently close to the town and all its amenities, including the new Lexicon shopping and leisure centre, the Fitzroy Collection is in a quiet situation in Old Bracknell Lane. There’s an added bonus in that the secure private parking, with two spaces earmarked for each penthouse, is tucked away under the apartments, so there is little noise to disturb the enjoyment of rooftop living. There is generous internal areas of open-plan living, dining and kitchen space to enjoy. Meanwhile, three good-sized bedrooms, one of them with an en-suite bathroom, give plenty of scope for overnight guests or family life. The vast expanse of glass used in the penthouses means that all the main rooms enjoy plenty of mood-improving natural daylight as well as the relaxing views. Despite all the space and luxurious touches, the Government’s Help to Buy equity loan scheme means that all the apartments at The Fitzroy Collection, including the penthouses, remain affordable. The scheme offers all purchasers, including first time buyers, the chance to borrow from the Government 20% of the price of a brand new home, meaning that purchasers won’t have to spend as long saving up for a deposit or pay increased interest rates for a high loan-to-value mortgage. Help to Buy is available on new homes costing up to the value of £600,000 – so all of the new properties at our Fitzroy Collection qualify for the Help to Buy equity loan which is interest-free for five years, and effectively allows purchasers to get the keys to their new home with just a five per cent deposit. So with the penthouses starting from £475,000, buyers would only need to save £23,750 as a deposit to start living the high life on top of the world in Berkshire. Get in touch to find out more about securing one of these stylish new penthouses now – View availability for the Fitzroy Collection here or call 01344 481 893 for more details.